Transaction management software is becoming increasingly beneficial to real estate. Selling a house is a business process, like manufacturing of any other industrial widget. The way you do it constitutes intellectual property; it makes your realty company different than the one around the corner. With the right software capturing that process, the more efficient it becomes. Replication of business processes is a fundamental component of growth. Each of the following solutions can help you do just that. Asana is a transaction collaboration tool that helps agent teams significantly reduce dependence on email and compartmentalize critical communications. Rooted in task creation, Asana enables users to burrow deep into the details of projects and tasks. You can invite people outside the office, like attorneys, lenders or other agents. Inbox: Asana nicely pulls it all together, capturing everything project-essential into a single landscape. Agents avoid jumping from CRM to inbox to mobile phone to gather sale intelligence. Organization: Asana is a crafty organizer of what’s important in projects. It intuitively puts everything into a hierarchy that’s easy to manage and respond to. Nekst is smartly simple and remains one of my favorite column subjects. 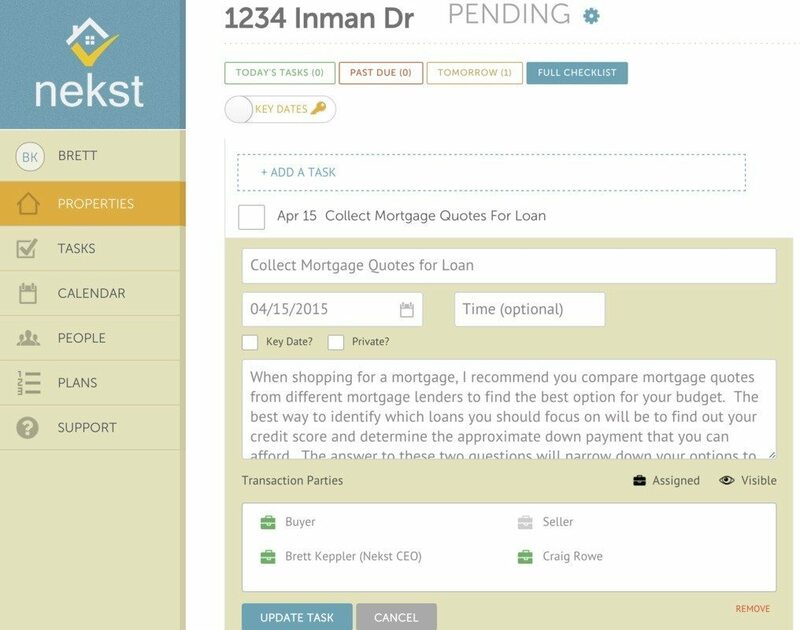 It helps organize and connect the minor, nonfinancial transactions that drive real estate sales, the daily tasks busy agents have to manage. Nekst is driven by a series of Plans, or a set of tasks. Each type of Plan is assigned to a Property. Agents can embed customers into the sale to assign them tasks, create rapport and shed light on the process. Plans: Nekst comes with a set of “plans,” or list of tasks that make up a typical sale. You can also build your own, and nothing captures the idea of capturing business intelligence better than Nekst’s task-driven transaction oversight concept. Simplicity: It’s all about making it visually organized and uncluttered. The interface augments efficiency. Inviting collaborators, adding documents and managing permissions are super intuitive. The Web-based RealtyBackOffice couples transaction management with a document library to offer brokerages a great platform from which to become highly forms-automated. We all know how much delay paper causes. 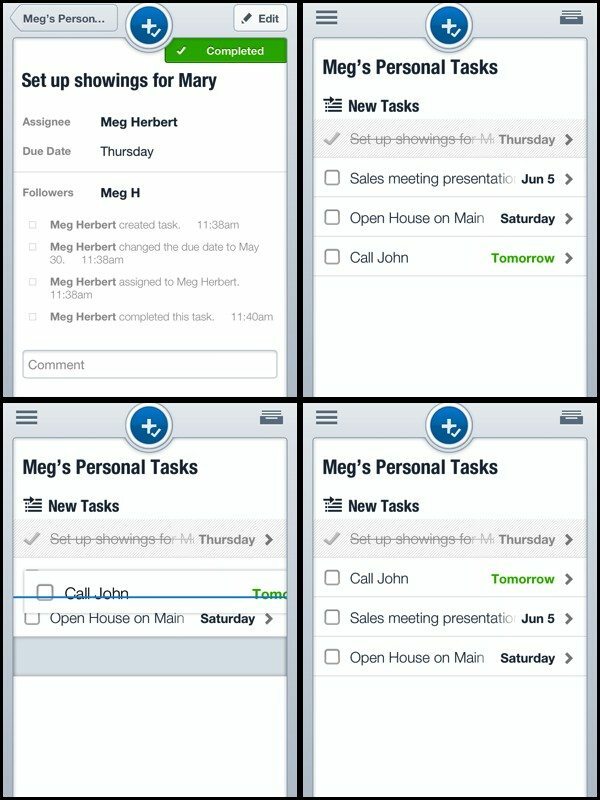 Agents and admins can create new documents, assign tasks, add notes and generally run a sale from start to close. Mobile forms can be accessed and executed via tablet devices. Any transaction can be saved as a template for ongoing use. It’s in the details: RealtyBackOffice leaves no clause unread. This is robust software that also invites brokers to manage agents and project revenue. Document automation: This is an absolute necessity to making every business run better, not just real estate. Modern business has outrun paper. When that idea is fully embraced, just watch what the Internet does to business. Are you considering a transaction management solution? Those mentioned here are just examples I happen to like. You have any? Do you use any of these tech tools — and what do you think? Leave a comment and let us know!